About your remarks on identifying the model. I am sure the modeller built the model after an example he could actually see. He didn't just build from his own imagination. The detailling on these kind of models is just too great. The modeller probably had full access to the actual ships. Maybe he could even see them being build or lying in the harbour from his window. You just don't come up with things like higher placed channels on your own. That the Hohenzollern-model was a gift, is likely. I assume the models were built with the weapon shield of the receiver on the stern. In the case of the Hohenzollern-model, the weapon is the weapon of William III. I presume he was the owner of the model when he gave it to his relative, the elector of Brandenburg. But, no proof for all of this, just speculation. I know the picture of the Gent-model in Carr-Laughton's book. But, it's in black and white. No way of telling what the actual colours were. If the sculptures were guilded or simply painted white, like parts of the hull, is hard to tell. Some other black and white pictures of the model in it's old guise, show that the eagle on the stern holds a weapon shield with a faintish lighter stripe; the weapon shield was not totally black. We must not forget that Birnie did a great job. The model was in a very sorry state when he began his work. He sent me some colour photographs of the model before he started his work; it was a big mess, and he didn't have much to go by. He did a great job turning it into something more representative and more presentable. Sure, he made some mistakes. But that's the risk of being in the restoration business. When you're finished, no one appreciates your work, and you're sure to have made some mistakes. Don't forget: all restored models show mistakes. About the scale of the Gent-model. As mentioned before, I think the scale is 1:16,5, since this relates to 1 inch to 1,5 foot. For the Hohenzollern-model the scale probably was 1:22, since this relates to 1 inch to 2 foot. As you know, Winter gives 1:21, but I think that's a mistake. I have the Object ID of the NMM Picture showing the Pacificatie PAF6867. May I ask you another favour? Can you please post a Picture of the Side-gallerie of the Gent-model and also one of the Galion with the figurehead, all seen from the side?. These two parts are heavily decorated, I would really like to see them a little closer. Thank you! May I ask some questions: I have read on an other webside, that the upper Stern can be removed just like in the Hohenzollern-model, so that you can see inside the captain´s cabin and the room above. Is that true, and were you able to take photographs, and can you post one or two here? As you may know, there are two particular places, Winter provided no photos from: The captain´s room looking back, so that you can see the bench of the gallerie under the four Windows, that Witsen mentions (Is there a bench on our modell?) and the door of the side gallerie. In the Vasa these backstructures of the "spiegel" are all left open, but in 1665-70 there must be decorated panels. Is there a photo with that backview available? That would be great, because I´m really not interested in modelmaking from a modelkid or the like, but to approach the truth as near as humanly possible. The other place Winter could not photograph is the gun room under the captain´s cabin looking aft. He mentions very heavy timbers (worpen)and kness at this place. Is that so? I think, they are building the "Zeven Provincien" in Lelystad considerably lighter at this particular place. Would be great to find out. Let me also share some thoughts: If the builder of our model is a professionel "Bouwmeester", and has a professional woodcarver at his side, I don´t think he needs a real ship to look at. He can write his own specification and build the model after it. Besides, the first appearance of the raised chainwales occured already in 1663. The Spiegel, De Ruyter´s ship in West Africa (and also already a 3-decker, of course without guns in the waist section of this "verdeck"!) had them. There are other examples, too. Wappen van Utrecht 1665, Reigersbergen 1665. Our model could be from 1665 or later! I don´t think, he made it up, as you say. On some of your photos you can a hole in the "setzboard" and on the inside at that place a cleat on the "Bosbank" with a notch in it, seen from inside the hull at the after end of the "back". The fluke of the anchor can rest in this notch, and the anchor itself can be fasted on the chainwale at the same height. Just check out the Van de Velde-Pictures! This hole for the anchor fluke occured freqently in the setzboard of all types of ships, and already earlier to our timeperiod. A heighted chainwale does not always occur in connection with that hole, but it is a practical solution and was done sometimes. So I cannot share your view about the point, you mentioned. I really think, searching for a real ship for our model is futile. In any case, one will never stop asking questions in this field of historical study, and that makes it so interesting and fullfilling, such as building a detailed model after all that study. The model in my office was built in 1660 by Francis Sheldon, an English shipwright newly arrived in Sweden. Many people have tried to connect it to a specific real ship, usually either the Swedish ship Äpplet, built by Sheldon a few years later, or the Cromwellian ship Naseby, which Sheldon may have helped build before he left England. The Naseby adherents are particularly adamant, even though the dimensions of the model and the gunports do not agree with the sources. Yet the model has a number of curious features, in that the style of the beakhead and stern are very old-fashioned (more 1630s than 1660)and the construction of the coach is very odd. The papers in the admiralty regarding this model show pretty clearly that it is not a model of a particular ship, but a model made by Sheldon specifically at the request of the king, perhaps as a decorative or trial piece, before he had been contracted to build any real ships. It may incorporate ideas which he later used in Äpplet, and it almost certainly reflects his background in English yards in the 1640s and 1650s, but it is not a "builder's model" in the traditional admiralty sense. The model called Amaranth in the Swedish National Maritime Museum is a similar sort of fantasy, it cannot be connected with any specific vessel known to have been built for the navy in the 1650s or 1660s. I thus would not be surprised if the model in Gent is also hypothetical. Even if it is a model of a specific ship, that would not guarantee its fidelity to the original's dimensions or configuration. Models are an idealized version of how a ship is supposed to be, not necessarily a depiction of the reality as built. I would question the notion that the higher position of the chainwales is "modern." Not only do they appear on ships of the early 1660s, they are in this higher position on Vasa, built by Dutch shipwrights in 1626-1627. In fact, the chainwale position on the Gent model is exactly the same as on Vasa - the fore and main chainwales are bolted through the wale immediately above the gunports of the upper gundeck, with the mizzen chainwales a little higher. I would agree that even though the model was rerigged in the 19th century, the chainwales and lower deadeyes appear to be the right type for the 1660s and so may have been retained. I thought a good portrait of Pacificatie had finally emerged from the many archives. Alas, no such luck. 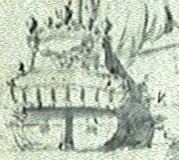 The Van de Velde-drawing in the NMM (PAF6867), is too little to go by. Here are the two requested pictures: side gallery and head. Look at the beautiful vases on the outside of the rails: so very Dutch I never came across another example. I was not allowed to remove the upper stern piece from the model. I tried though, but either the piece was stuck or was not removable at all. It was only possible to take pictures through the windows and ports. So I was not able to take the pictures you request: captain's room looking aft and constable's room looking aft were not possible to make. By the way, the central cartridge store bulkhead in the constable's room we know from the Hohenzollern-model (Winter, Abb. 37) is missing in the Gent-model. If it was there in the first place and went missing, I don't know. Don't get overexcited Rein! Read before you fire. In my last post I am not stating that the modeller did invent the higher placed channels; I am saying that he must have seen them at first hand or, in case he is a 'bouwmeester' himself as you say, might even have designed them himself. If the modeller was a 'bouwmeester', I think it would be unlikely that he built a model that would not resemble the ship he was building or had just finished. And, I am not saying that the model is not from 1665 or later. Read my earlier post: 1660-1670. You're right in saying that many other ships had high-placed channels. Was I denying that? The first probably was Spiegel of 1663. If she was a threedecker? I'm not sure. Probably the wales could be placed higher up because the third deck was able to counterbalance the extra forces that high up on the side of the ship . So the higher placed channels could be a telltale sign for a third deck. That would make Spiegel a threedecker. I never came across any other proof. Please be of help here Rein. Thanks for sharing your thoughts on the anchor-cleat on the 'bosbank'. I am not sure what you mean with that you can not share my view about that point. I never made a comment about that cleat. I just published the picture of it to show the detail of the model: without comment. Maybe searching for a real ship for our model is futile. But wouldn't it be great if the model represents an actual ship? It's a shame that in these kinds of models the denominator for the name, the sculpture or painting on the upper stern, is changed to please the receiver of the model. But, rest assured, I will be able to sleep without identifying the model. I am doing so for years now. Your last remarks make me think you're doing research for a model of a certain ship. May I ask which ship you are working on? Thanks for sharing your thoughts on the Sheldon model. Would that be the model you were going to place pictures from on this forum? Just kidding I think we can be pretty certain that Sheldon used his experience of the English dockyards to make his model. It may not depict an actual ship, but it probably combines features of ships he built and some new features he would like to incorporate in his next ship. I guess that's how progress works: use the good things from old designs, discard the bad things, change the bad things for something better. Of course you're right about the high-placed channels on Vasa. The 'modern' was only meant for ships from the later age. The ships from the building programs of the sixties, e.g. Zeven Provincien and Hollandia, had low channels. High channels were probably introduced by the Admiralty of Amsterdam in 1663. It might be a coincedence that this came about at about the same time that this admiralty started building threedeckers. Thanks for sharing my thoughts on the channels (or chainwales) and the deadeyes. Here's another one for you. Thank you for this great photos! Let me share with you my thoughts about the "De Spiegel", 1663. Unfortunately I´ve not yet figured out how to post pictures here. So I give you two webadresses, which in my opinion both show this ship. Type in "Willem van the Velde" and find the picture nr. 328. Doesn´t that drawing show exactly the same ship as in the painting? You will also notice this to be a threedecker - no rail across the ships sides at the main mast. Interestingly it is also heavily decorated. So the question is: Is this a Van-de velde drawing, and was it then used by Storck, or whoever made this painting (Ludolf Backhuysen?? ), or was it drawn by the painter himself? For me the "De Spiegel" is shown here. Currently I´ve no plans nor the time to make a model, maybe in some later years. But I´ve always enjoyed doing research in this field and will continue to do so. May I request one last photo of the Gent-model? The highest heavily carved "hackboard" (lions and dolphins intertwined an a putto sitting on an eagle), but seen from inside the ship. There must be a bench for the trompeteer. Also chickens were kept under the bench in a cage back then. That can be seen in many Van de Velde drawings. I don't believe the painting depicts a scene from 1666 (fourdays battle) as you say, since Gouden Leeuw is in the far distance. That ship first saw action in 1667, Medway. Regarding Spiegel: everybody can determine for himself if the ship on the far right of the painting is the same ship as in the drawing. And then we still have to find proof if the ship in the drawing is Spiegel. Rein convince me please. All the other paintings and drawings that are surely of Spiegel (Boymans, Louvre, R&H-collection), do not make clear that it's a threedecker. One even showed Spiegel with low-placed channels. I tried to find references of Spiegel being a threedecker in De Ruyter's journals of 1664/65, but, diagonally, not thoroughly, read, I couldn't find any. So it's up to you now. Here's the picture you requested. No chicken coops here, just a closed bench. Some nice guirlandes though. Hope this helps. Concerning De Spiegel as being a threedecker: I have only one piece of evidence left. Please decide for yourself, if this is valid. If you look at the drawings of the Amsterdam warships of this period, you may notice 2 different kinds of ways how to structure and decorate the Stern. She Spiegel differs in that respect from, say the Hollandia oder the Gouda. Between the four captain´s cabin windows there are 4 strong an high statues. The reach up to the top of the cabin above. So the element of verticallity is strongly emphazised. Hollandia, Gouda or our two models have only puttos between the Windows. And now follow this: Surely you know the Van de Velde drawings of the Amsterdam ships build for France in 1666 and later (6 or even more; they don´t kwow for sure), and the three big Amsterdam ships Gouden Leuww, Olifant and Dolfijn. They all share with the Spiegel this element of verticallity in the decoration, and they are all threedeckers! I cannot escape the thought, that with the Spiegel some kind of canonical procedure was established for the first time, how a threedecker should look like! Wasn´t she kind of a a prototype? Maybe you also know the two drawings of the Princess Maria and the new Hollandia of 1683. They still have the same difference of appearance, and at this time you can call them righteously a first-rate and a second-rate. Under William III the Dutch adopted this classification from the English. So this ist my main argument, and I have no other at my disposal. By the way, Witsen gave us two "certers" of a 170-footer called "Vrede"(1667), and one of 160 feet (1669). They are both very high built in the hold, 19,5 and 18,5 feet. Could it be, that these two were also built for Louis XIV? With this big holds they seem quite unsuitable for the shallow dutch coastal waters (ahead of the third war against the English). May I ask another question? Heinrich Winter photographed parts of the hull of the HZ-model four times at very close range exactly from the side. I put this four photos together and in this way obtained a nearly complete close-ranged side view of the entire hull. Could you please post such photos, if you should have them; or one more distant side view of the hull. Many thanks! Thanks for sharing your thoughts on Spiegel. So, when I interpret correctly, you're saying that the decoration of the stern of Spiegel determines that she is a threedecker. I know what you mean because Gouden Leeuw and Witte Olifant show the decoration you describe: high statues between the windows of the captains cabin. But... Spiegel and the six French Dutch-built ships of 1666, do not. When I look at the Van de Velde drawing of Spiegel in the Boymans-museum (Robinson, III, p.158), for me the most reliable picture of the ship, I see five small putti between the windows. When I look at the Van de Velde drawings of the French ships in the same museum (Robinson, III, p.311-316), I see the same short putti as with Spiegel. To determine the stern decoration of Gouden Dolfijn is not easy because there are not a lot of stern views available from this ship. As far I know, the Gouden Dolfijn probably had the same decorations as the French ships. So when we restrict ourselves to the decorations, Spiegel could be the forerunner of the French ships and the Gouden Dolfijn. That raises the question if the six French Dutch-built ships were threedeckers. They show the higher waists, which might imply that they were threedeckers, but they also show the bulkheads aft of the forecastle and forward of the halfdeck that normally were omitted with the Dutch threedeckers. What complicates the matter even more, is that we have the contracts for the French ships; and the French ordered twodeckers, not threedeckers. Please, don't get me started on the many misconceptions about the Dutch threedeckers: this is not the forum to elaborate on that. About the sideview of the Gent-model: I am sorry, the box the model is kept in, was jammed between other museum drop outs. This means I could not get enough distance to make a complete side view. Luckily the museum took a picture of the model while being prepared for the transport to the depot. It was published on the web by the museum, so I think I am allowed to include it here. I hope this helps. Here it is, althought a little primitive. Bye! On the right there is a stern view of the Waasdorp, 1663 (Webside of the British Museum). I believe the hull drawing on the left could be of the same ship. I found it on the Internet, but lost track where. Do you know something about that drawing? There are great similarities in the upper stern and sidegalerie decorations. Thanks! The drawing from the stern on the right, the one from the British Museum, surely is Waasdorp. 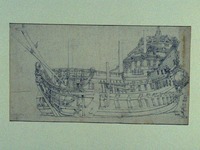 The Boymans museum has a drawing that has been offset from the same drawing as the one in the British Museum, and that drawing is inscribed by Van de Velde, showing that the depicted ship is Waasdorp. It is difficult to identify the left ship from the right, so I tried to identify your ship in another way. Here we go: deducing from the higher wale position only, the following ships might comply: Spiegel and Waasdorp from 1663, Utrecht from 1665, Gouden Leeuw, Witte Olifant and Gouden Dolfijn from 1666/7, the six Dutch built French ships from 1666/7, Steenbergen from 1671 and the Amsterdam ships from the 80's. And, maybe even the obscure Pacificatie from the Noorderkwartier Crone suggested for the Gent-model. We can discard most of these on other grounds. I also compared your drawing to another Waasdorp-drawing in the Boymans-museum. That drawing is inscribed by Van de Velde and so is sure to represent Waasdorp. Waasdorp in the Boymans drawing is depicted from the front also, but seen from the starboard side. This drawing is not an offset from your drawing. Comparing the two makes it likely that your ship is Waasdorp: both drawings show a twodecker with high channels, the gunport configuration is the same, the positions of the deadeyes relative to the ports are the same, both ships show the bound slaves on top of the ends of the side galleries; the same decoration that we see on the stern drawing on the right. There are a couple of discrepancies though: the heads, the roman heads, on the ends of the upper rails are larger on the Boymans-drawing, the Boymans-drawing does not show the two small guns on the poop deck and in the Boymans-drawing the two lions on top of the upper stern, don't seem to be looking forward, but aft. What made you think the ship on the left is Waasdorp? I don't know where you found the drawing on the left. Thanks for posting it here. From what you wrote last time, I´m now even more convinced, that this ship is indeed the Waasdorp. De discrepancies you discribed seem minor points to me. There are many Van de Velde drawings of one and the same ship, where such differencies occur. In the process of drawing on location, then redrawing or copying and finally making a painting or a grisaille, it´s almost normal that errors or ommissinos can happen. We also have a transition from Van de Velde father to son. The same thing happens in spoken language. One message will come out differently, when delivered by different people. Can you please post the Boymans hull drawing of the Waasdorp here? - If it is not restricted by Copyright, of course! I surely would like to compare the two drawings and draw my own conclusions. About the two lions on top of the upper stern: Are you aware, that many dutch warships, not all, have these lions obviously carved with double faces, one looking inwards, the other outwards. Just look at pictures of the Eendracht 1654, flagship of Van Wassenaer; or the Hollandia 1665, or the Steenbergen 1672, and others, from different angles. For me, this is a remnant of the highly allegorical function of shipdecoration in the first quarter of the 17th century. The lions threaten enemies as well outside the ship as inside. The Vasa surely is one of the most magnificent examples for this; just read "The power and the glory" by Hans Soop. Now, in the sixties this function obviously is no longer that important, the decorations are already more or less standardpieces. The question you asked: It´s just the great similarity of the decorations on the upper stern and side gallery, after I had looked at the British Museum drawing!